The Leaky Shed Studio is always humbled when we see our chipboard being used by amazing designers other than our own! We love to see the different ways and techniques these designers are using on our chipboard. Today we are featuring a special kit club who will awe you with their beautiful layouts. The Scraps of Darkness is a monthly kit club that specializes in bringing you superior quality art kits designed for scrapbook artists who love mixed media, grunge, and other alternative styles. If you are looking for the ORIGINAL kit club that gives you an alternative to what all the other kit clubs are offering, look no further, because they are the kit club for you. Their kits, along with their world class Design Team, Educators, sketches, tutorials, forum, and gallery, will satisfy your artistic addiction. The Scraps of Darkness December Kit- Winter Wonderland release is a beautiful Wintery themed kit that contains so many beautiful products including Leaky Shed Studio's chipboard Snowflakes and Christmas Tree. Lets see what their designers did with this beautiful kit. Amazing work ladies! For more details on this fabulous work or to purchase this beautiful kit, visit their blogs and the Scraps of Darkness web page. If you would like to include some of the Leaky Shed Studio's Chipboard in your kits please feel free to contact Wendy and Bill at the Leaky Shed Studio. 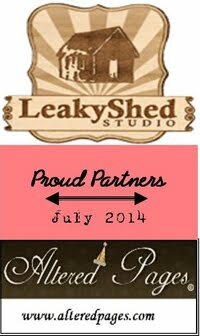 Thanks for stopping by the Leaky Shed Studio Blog today!! Thank you for this beautiful feature, Bill and Wendy! We love including Leaky Shed in the kits! Love seeing our design team featured! Great job Ladies! Thank you Leaky Shed! Wow!! These are all GORGEOUS!!!!! !